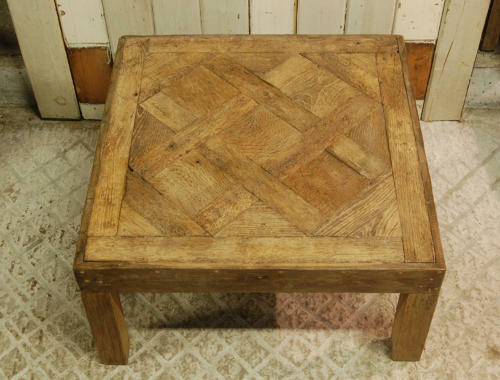 A beautiful, reclaimed, square coffee table made using a fantastic reclaimed oak parquet de Versailles panel. The table has chunky oak legs on each corner and an oak frame surrounding the panel. The panel is antique has has wonderful character and aged detailing. The parquet is well constructed and has an attractive grain and colouring. The table is ex-display and was used to illustrate oak flooring samples, therefore it is not jointed but the table is solid. We have photographed a picture of someone standing on the table to illustrate strength and the base has been photographed also. The panel is reclaimed and therfore has signs of wear that give interest and adds to the tables rustic quality. The panel is not flat but is suitable for cups and plates. There are treated woodworm holes on the surface of the panel. There are some chips, cracks and knocks to the oak and some slight erosion and light damage. Some marks and scratches are present. The table has a unique look with a stunning, rustic, country style appearance and would be a fantastic showpiece within a home or business.